House Prefect, meaning the one student you will have to listen to in Harry Potter: Hogwarts Mystery. It is more like a tittle in Hogwarts School of Witchcraft and Wizardry. They are chosen every 5th year and they keep that title and its obligations until they graduate at year 7. They are given a great responsibility to watch over students, and especially the freshmen. They will want to keep everyone in order and they have also been granted the power to punish if needed. Punish meaning they can give detention or even take house points, but only from the Hogwarts House, they are sorted in. In Hogwarts Mystery, there will be a total of 4 Prefects despite the movie franchise having 24 at one time. For Gryffindor that will be Angelica Cole, for Slytherin Felix Rosier, for Ravenclaw Chester Davies and finally for Hufflepuff it will be Jane Court. 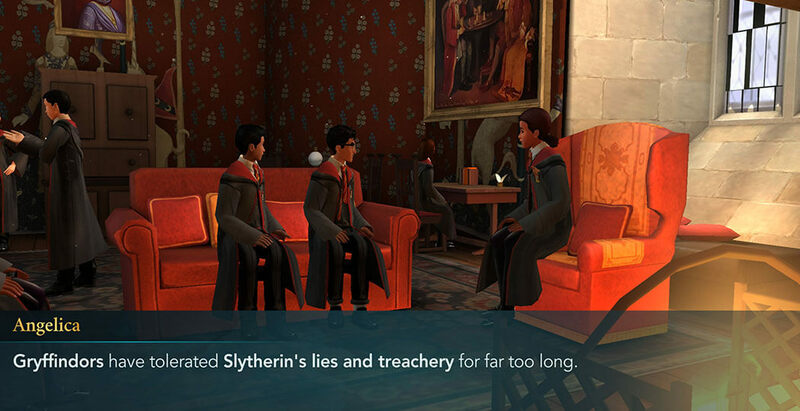 In the game, as the story goes on, there won't be major differences between the House Prefects. They will all act and do the same quests no matter which house you pick. Chapter 3: First meeting with your House Prefect will occur in your common room after you lost 10 house points in the potion class. Your Superior will be enraged that you already lost points, but he will show you the letter that allegedly Professor Snape sent, regarding how to regain the points you lost. He will also mention your missing brother Jacob and that he should have kept a closer eye on you and your actions. Later on, after your protagonist ends up locked in the Potion Storeroom with the Devil's Snare attacking you and Rowan Khanna, you will meet with the Prefect so you can explain to him what happened, and that Merula Snyde is the one who sent the fake letter posing as Professor Snape. You didn't have any proof so your House Prefect didn't find a reason to believe you at that moment. Chapter 4: House Prefect will ask you to meet him at the Training Grounds. There he will express his wish to teach you how to defend yourself, but in order to do that, he will first send you to learn a dueling spell from a book located in the Artefact room. Chapter 5: When your protagonist learns a few dueling spells he will meet with your HousePrefect in the Courtyard, where he will show you the basics of dueling, and for your first duel you will be using Rowan Khanna as an opponent for training. Afterward, he will be pleased he taught you to duel so you can represent your house in a better way. Chapter 7: You will once again face your House Prefect in the Common Room where he will talk to you about the consequences of breaking the main school rule, which is dueling outside of the class. He will be furious because you yet again lost points for your house. There you will get an explanation on how important it is to win the House cup and that you will have to do everything in order to regain the points you have lost. Chapter 8: House Perfect will summon you to meet him at the Training Grounds. There you will be told to prepare for the hardest duel you will have in year 1, against your own Superior! First, you will have a warm-up duel with Ben Copper and then you will finally face the hardest challenge, to win a duel against your House Prefect. Chapter 9: Meeting with other students and the House Prefect so you can discuss ideas and tactics on how to win the House Cup. A few days later, your Prefect will approach you in the Great Hall at lunch and tell you that words travel fast and that he knows that you were lurking in the forbidden corridor. He will also add that the school headmaster Albus Dumbledore wants to speak with you. Still the House Prefect, Angelica continues to take care of her fellow Gryffindors. She is always there when you need her, whether it’s to help you herself or point you in the right direction. In the second year, you will also get to see her playful and sneaky side as she leads all of the Gryffindors in a mass prank war against the Slytherins. Chapter Three: Angelica calls a meeting in the Gryffindor Common Room to discuss how your house will take revenge against Slytherin. After some mild planning, it seems you have come up with a rough outline which will be perfected. Angelica asks you to lead your house in the endeavor and be the leader you were meant to be.